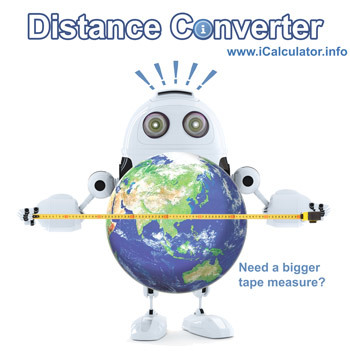 The distance converter converts distance into relative units, for example metres into yards. Did you know? It is 363,104,000 metres to the nearest point on the moon, which is the equivalent length of exactly 1,296,800 Queen Elizabeth class aircraft carriers (Queen Elizabeth class aircraft carrier is 280 metres long) or the height of 1,186,614.379 Shard buildings ( the Shard is the tallest building in the UK at 306 metres). The distance converter is provided for calculation and conversion of distances online. The converter is free to use within the iCalculator website. Distance conversion can be interesting, particularly for the younger elements of society who are often baffled by the number of imperial distance units in a metric measurement. Metric distances and international standardisation of distance units has dramatically simplified distance conversion. It is easy to travel between countries and understand the speed limits, currency calculations and so forth. Centimetre is the correct spelling, not centimeter. The same applies to metre, it is not meter. The spellings were part of the internationally agreed unit of measurement act designed to allow simple exchange of information and trading. Please contact us if you notice any errors or if you know a measurement unit that isn't on the conversion calculator whether current distance units of measurement or historical distance units of measurement.